Since the dawn of the digital age, the amount of data stored on servers has risen dramatically. With this increase, more and more firms are looking for talent that can handle their datasets and generate insights for business decisions. 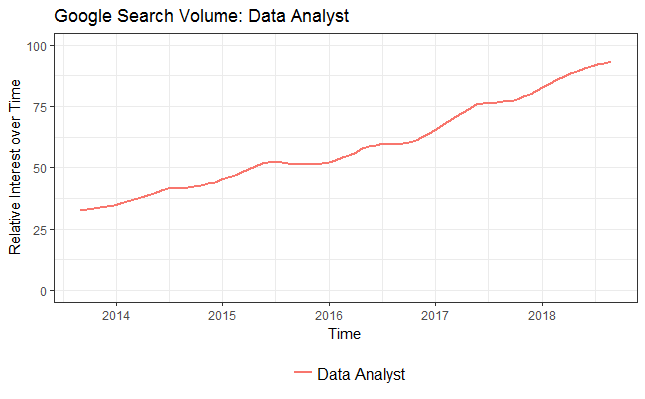 Google Trends shows that the global volume of the search term “Data Analyst” nearly tripled over the last 5 years. How does the increasing demand translate into earnings of data analysts in Europe? We collected salary data from Glassdoor on 10 countries in Europe. In the workplace, salaries are neither transparent nor openly shared in most cases, and few reliable resources are available. Glassdoor offers self-reported salary information by location and employer and thus provides some insights into the salary structure of data analysts. We collect 1190 salaries for job titles containing “data analyst” in Austria, Belgium, France, Germany, Ireland, Italy, Netherland, Spain, Switzerland and the UK. This involves 956 Data Analyst positions and 234 senior roles. To make salaries comparable, we transform them to annual salaries in Euro ( GBP/EUR: 1.12 , CHF/EUR: 0.88). The figure plots mean nominal salaries per year by country and seniority. Junior level salaries range from EUR 24,700 per annum in Italy to over EUR 83,000 per year in Switzerland. Together with Switzerland, Germany and the Netherlands, with around EUR 50,000 per year, belong to the leading group. 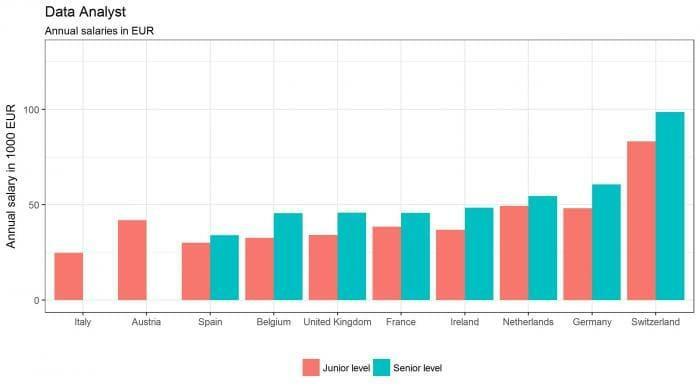 Overall, the median annual salary for junior positions lies around EUR 35,000. With wages close to EUR 100,000 for senior positions, Switzerland stands out strongly from the other countries. The nominal salaries tell little about the underlying purchasing power. For example, Zurich and Geneva are famous for being among the most expensive cities on the planet. Thus, we use the OECD price level index to adjust for the local price level and compute real wages. The table below depicts the average annual salary for junior level positions. The OECD index shows that the cost of living in Switzerland is more than 70% higher than in Spain. Hence, parts of the differences in salaries for data analysts can be explained by the differences in the cost of living. However, accounting for the cost of living changes the ranking only slightly. Only the UK, where in particular London is a rather expensive place to live, loses some ranks. Switzerland keeps the first place, but the difference to Germany shrinks down to about EUR 8,500 per year.